Flexiducting New Zealand for Hot Water Hose and Steam Hose supplies. We have mandrel built reinforced rubber hoses for conveying steam and hot water. 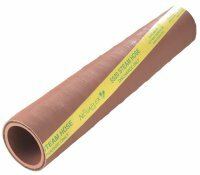 Where an industry requires the safe transfer of liquid up to 120 Deg C. Flexiducting offer full hose assemblies with swaged on couplings to suit your requirements. Supplying conductive and non-conductive steam hoses and hot water washdown hoses. A high quality hot water washdown hose designed to meet the rugged washdown applications in the New Zealand food processing industry. Cover: White EPDM non marking. Black Low Pressure Rubber Conductive Steam Hose 100psi. This textile reinforced steam hose is an excellent flexible light weight hose for transferring steam in medium temperature applications. 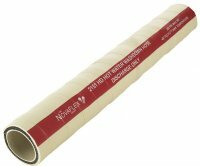 Red Low Pressure Non-Conductive Steam Hose 100psi. 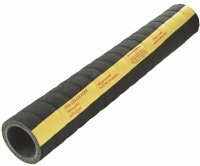 This textile reinforced rubber steam hose is an excellent flexible light weight hose for transferring steam in medium temperature applications that require an electrically non-conductive hose.